Outdoor fountains are a stellar way to level up the design and landscaping of your outdoor property. They add visual appeal, tranquility, and an overall atmosphere that nothing else can achieve. They’re also pretty pricey, although worth the investment. But if you’re going to invest the cash into your yard, then you should also fork up the time it takes to maintain the fountain. Winterizing an outdoor water feature, especially in locations that experience drastic seasonal changes, is very important to the lifespan and functioning of your outdoor water fountain. 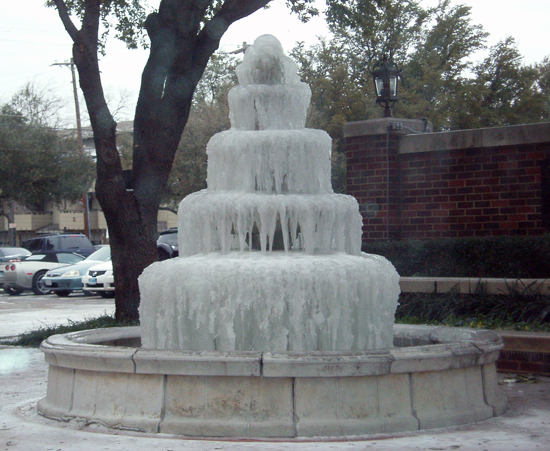 If you don’t’ winterize your fountain, then leftover water and residue will freeze and expand during the cold weather and possibly destroy your fountain. But how do you do this, you ask? Just follow these simple steps. Get ahead of the seasons and drain the water completely from your fountain before frost sets in. Make sure to remove any excess water from the fountain as well as the pipes, hoses, pumps, and motors. This can make quite a mess so have a bucket or wash bin handy. Disassemble the fountain as much as you can. Taking the whole display apart ensures that as much water has been drained as possible and allows you to clean hidden areas that you may not have noticed beforehand. Taking apart the fountain pieces lets you properly clean, wrap, and store the unit. Wash all surfaces of the fountain with warm water to remove any dirt, algae, or bacteria that may have built up over the year. Focus on the pump and motor mechanisms especially, these will have to be thoroughly cleaned and then stored away for the winter. Once you’ve drained and cleaned your fountain now it’s time to dry it. Make sure any excess water has been wiped away and then proceed the wrapping process. Start with a layer of burlap. This will whisk away most water during the winter. Then, wrap another layer of landscape fabric or an actual fountain tarp. These are made from waterproof materials and will protect your fountain. Now that your fountain has been winterized, use this time to fox or replace any parts such as the motor, pump, hoses, or display features. During the winter months, these pieces often go on sale and you can stock up for the coming year. Winterizing your outdoor fountain is just one step to take in the care and maintenance of your investment. And if you’re looking to add more water displays to your landscaping then check out some of these gorgeous outdoor fountains that you can order online! OutdoorFountainPros has the best selection and quality of outdoor fountains on the web.